Artist, poet, playwright, novelist, inventor, and entrepreneur, Mina Loy (1882-1966) was a great innovator in feminist design. Her experimental writing, typified by radically new uses of language, typography, and page space, appeared primarily in little magazines, garnering attention for its bold feminism and innovative forms. She painted in oils and watercolors and created constructions (or “refusés,” as she called them) out of debris she collected in the Bowery. She wrote poems, plays, fiction, essays, and found-conversation compilations. She designed lampshades, hats, and corsets, and invented household tools and posture devices. As Sasha Colby points out, Loy was a multimedia artist before the term even existed: “retrospectively applied,” the term “is appropriate to Loy, who was herself a multimedia producer of text, watercolours, montage, and objets trouvés” (114). 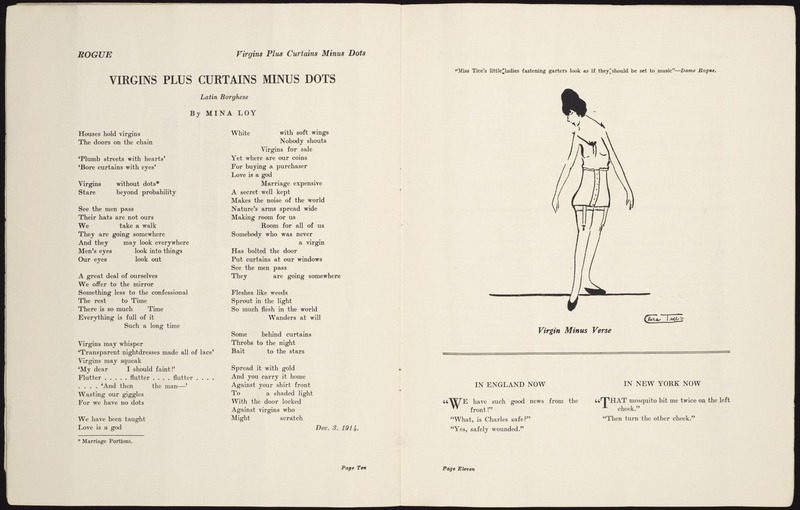 Loy’s poem as it appear alongside an illustration by Clara Tice in Rogue 2:1 (Aug. 15, 1915): 10. Lunar Baedeker & Time-Tables (Highlands 1958). and her edited novel, Insel (1991, 2014). Loy’s unpublished writings, as well as her paintings, sculptures, constructions, lampshades, and designs, comprise a larger body of work. Much of the uncollected material is held in Yale’s Beinecke Library (including the recently digitized Mina Loy Papers), while the visual art and some manuscripts reside with a number of private collectors. The location of other work remains unknown. Until recently, Loy’s work has been difficult to access, and much remains outside the public view. Complicating the issue of access, Loy’s peripatetic career, which traverses multiple genres, media, continents, and avant-garde circles, does not fit neatly into the linear form of a traditional print monograph. She moved in the circles of Futurism, Dada, and Surrealism and migrated among major metropolitan centers of avant-garde activity, including Paris, Florence, Rome, New York, London, and Berlin, from the 1910s to the 1950s. As Carolyn Burke explains, “her transits describe not linear progress but a series of motions like the epicycles on the celestial maps in which she sought inspiration” (vii). A digital platform is an ideal stage for a study of Mina Loy and the avant-garde. The nonlinear, spatial affordances of a website provide more flexibility than a print monograph for mapping the coordinates of Loy’s career. In addition, the interchange between visual, verbal, and performative dimensions of her work invites multimodal presentation and interpretation. A website enables users to choose different paths for situating her work in relation to biography, geography, history, and theories of the avant-garde. It also allows users to comment on unfolding arguments, interact with authors, and participate in a dialogic process of scholarly inquiry. This kind of interactive capacity underscores the specific contribution that the historical avant-garde—considered not just as a historical movement or subject but as a range of aesthetic experiments that drew on diverse media and profoundly altered the reading and viewing experience—can bring to the creation, curation, and reading of online environments. If a digital platform can enable peripatetic reading and writing not constrained by genre, geography, or period, then it may bring us closer to post-canon literary studies that is not always reading women writers against a presumed norm for a genre, period, or movement but engages with their work on its own terms. Digital scholarship may allow us to navigate new pathways for understanding and theorizing the early 20th century avant-garde in all its complexity and diversity. Digital scholarship on Loy depends upon the groundbreaking work of previous print scholarship on Loy, which we survey in the next section.